We invite you to visit one of our many concession stands located throughout the XL Center concourse, operated by Ovations Food Services. 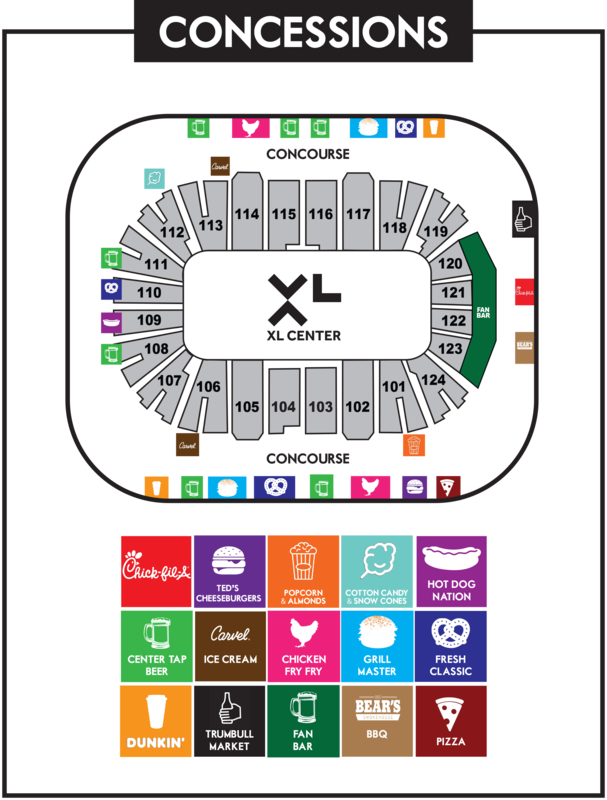 The XL Center also features Dunkin Donuts stands outside of Sections 107 & 118. The Comcast Coliseum Club Restaurant and Bar is the premier pre-event dining location at the XL Center. The restaurant and bar area are open to the general public two (2) hours prior to all UConn and Hartford Wolf Pack games. Offering a full menu and wet bar the Comcast Colisuem Club has something for everyone. The Comcast Coliseum Club is also an ideal location to host pre-event corporate parties, birthdays, or family events.